MONTREAL  Initiated and organized by the Musée de la musique with the support of the artist’s family represented through Miles Davis Properties, LLC, in association with the Montreal Museum of Fine Arts (MMFA), “We Want Miles: Miles Davis vs. Jazz” is a multimedia retrospective exhibition devoted to one the greatest jazz artists of the twentieth century: Miles Davis (1926-1991). Bearing the same title as Davis’s 1982 live album, “We Want Miles” explores many of the greatest highlights of Davis’ exceptional life and career. Tracing how Davis impacted the course of jazz several times throughout his life, and divided into eight thematic sequences arranged chronologically from his childhood in East St. Louis (MO), to his last concert at La Villette in Paris (1991), the exhibition features a wide range of exceptional works of art, archival materials, and objects many of which are on view for the first time. They include rare or previously unscreened concert film footage; original musical scores; examples of Davis’ trumpets and fellow band members’ musical instruments; original documents relating to his albums; stage costumes; vintage pressings of his records, as well as compelling personal portraits taken by legendary photographers Annie Leibovitz; Herman Leonard; William Gottlieb; Dennis Stock; Baron Wolman; Amalie Rothschild; Lee Friedlander; Bob Willoughby; Anton Corbijn, and Irving Penn, among others. While the exhibition examines the many ways Davis pushed boundaries of jazz, an entire section will also be devoted to Davis’ work as a visual artist and feature a number of his original paintings. 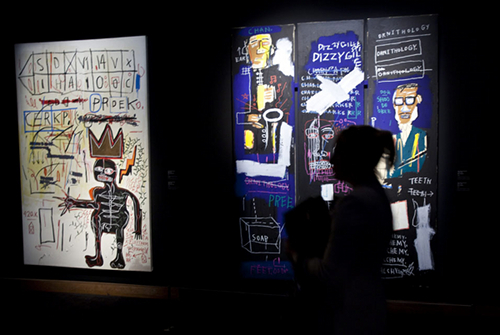 At first a means to rehabilitate his hand after a stroke, drawing and painting became a daily activity for Davis in the 1980s with select works appearing on his album covers. Further revealing Miles Davis’ reach beyond the sphere of music, the exhibition at the MMFA will feature a significant grouping of works, influenced by Davis, by contemporary artists, including: Jean-Michel Basquiat, Mati Klarwein, and Niki de Saint Phalle, among others. Serving as an invitation to rediscover the music and the immense talent of an artist whose jazz innovations in the second half of the 20th century were profound in their scope and consequences, this initial venture into the realm of jazz continues the Museum’s exploration of links between the visual arts and music launched with Warhol Live (2009) and Imagine: The Peace Ballad of John & Yoko (2009). The rise of pop jazz, marked by new production techniques and synthesizers, his fascination with Prince, his covers of hits, and his close collaboration with Marcus Miller, who composed an entire album for him, Tutu, as a showcase for what had truly become his signature sound. 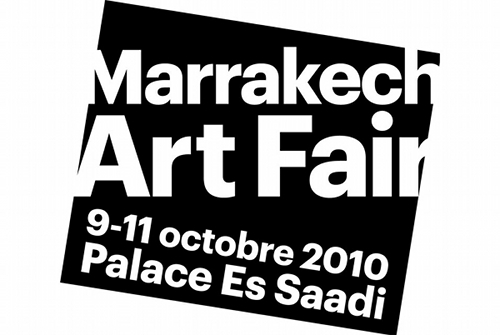 MARRAKECH  The first edition of the Marrakech Art Fair will be held from October 9 to 11, 2010 (with a preview on October 8) at the Es Saadi Palace. Galleries from Europe, Morocco and the Arab world are pleased to invite art amateurs and collectors to present their recent discoveries during a four-day event. Modern art, contemporary art, and emerging scenes will be high on the agenda, during an ephemeral leisure staged between patio and garden through art works and creations from the 20th and 21st centuries. A series of cultural and artistic events will take place along with the launch of the Marrakech Art Fair, such as exhibitions in cultural centres, visits of artists’ studios, presentations of private collections and more. The Marrakech Art Fair has also the «Golf Art Cup» in store, a golf competition between art market players, at the end of which a trophy made by a Moroccan artist will be awarded. This event was born from the collaboration between Moroccan and French art market players who combine their skills to provide Morocco with an exchange platform for gallerists, artists and collectors. The setting up of the Marrakech Art Fair is supported by Moroccan institutions: The Ministry of Tourism, The General Administration of Customs, the Moroccan National Tourist Office (ONMT) as well as partners such as the Es Saadi Palace, the ONAPAR Holding through the Amelkis golf club, and Prestigia, a company specializing in business travels and luxury stays in Morocco. Hicham and Zineb Daoudi, Brahim Alaoui, Caroline Clough Lacoste and Henri Jobbé Duval partnered to implement this totally unprecedented artistic meeting. They enjoy the support of the honour committee, made of people involved with the local and international cultural life … and Marc Blondeau has accepted to be among the fair’s guests. The Marrakech Art Fair is destined to become the yearly appointment of the art market in the Kingdom of Morocco, enhancing its visibility beyond its borders and being part of the international contemporary art fair calendar. Image: A series of cultural and artistic events will take place along with the launch of the Marrakech Art Fair. France 3 television’s Culturebox looks at the Niki de Saint Phalle retrospective now at the Château de Malbrouck, near Metz in the Moselle region of France. The clip (in French) includes an interview with Bloum Cardenas, granddaughter of Niki de Saint Phalle and trustee of the Niki Charitable Art Foundation. The exhibition, which runs through 29 August 2010, features 130 works spanning the entire range of Niki’s career, from the shooting paintings of the early 1960s to the massive mosaic sculptures created during her years in California.